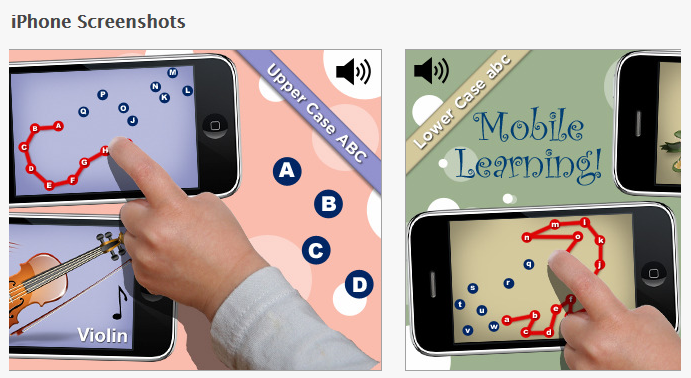 Looking for even more fine motor apps? Preschool Connect the Dots Game App – Compatible with iPad/iPhone (.99), provides over 200 puzzles with features allowing choices of connecting by numbers, upper and lower case letters. Customization of features such as autoplay, speaking letters/numbers and choosing categories of the pictures presented (animals, food, objects, transportation) are also provided with in the app. Preschool Connect the Dots shows consistent, great ratings making this a solid app choice. Different themes with different activities involving creating on the iPad or iPod requiring fine motor skills with step by step tasks. Here is a YouTube clip of Cookie Doodle. Do you have any of these apps in your OT iTool Kit? Share how you have used them! This entry was posted in App Reviews, Apps for OT's, Fine Motor Development, Finger Isolation, iPhone, iPod, Occupational Therapy, Pre-writing, Visual Motor and tagged App Review, Fine motor apps, iPad, iPhone, iPod, occupational therapy, OT Apps, Visual motor apps. Bookmark the permalink. Thanks for the good app ideas! I downloaded cookie doodle when it was recommended by another teacher, because I knew that our sub the following week was going to be bringing in heart-shaped cookies for the kids to frost. Spent a few minutes showing her how to use it, and the kids were able to go through the steps of making the sugar cookies, find the heart shaped cookie cutter and then frost/decorate it with her for 1:1 work time, then during our large group activity all 6 of them decorated the actual cookies. It has since become one of my students absolute favorite apps. Thanks Stacy! What age range of students do you work with? Shoe the Goose also makes Cake Doodle, Caboodle Doodle and Candy Doodle and more, have you used any others?